Posted on July 30, 2015 by Lena K.
The story is very simple: You have two high school girls, Akkii and Shouko, who are madly in love with each other. The problem is, they have some difficulties dealing with their feelings. And by that I mean that they are absolutely crazy for each other, but they get into very violent fights exactly because of this love that they can’t deal with very well. Putting it even simpler, right here you have a story about two yandere girls being in a relationship with each other. This is seriously like the most promising setting ever! There is nothing more to the story than the two girls getting into brutal fights each and every chapter. Be it out of jealousy, thanks to a stupid misunderstanding, or simply because they just can’t voice their love for each other any other way, 50% of what you’ll see in this manga is them fighting. “If you won’t be mine, then I’ll just kill you! !” – This actually describes their relationship pretty well. For some people, this might simply be too stupid to read, since there really is nothing more to this manga than two yandere girls being crazy (for each other). However, I see this as something really refreshing and new. As crazy and weird as this might be, it’s pure entertainment. I’ve seen yandere characters in anime, but I’ve never seen two of them being in a relationship with each other, especially not a yuri one. Well, there could have been more to the story, like a plot that goes beyond their fighting and also shows how they met, etc., but I really can’t complain. For a short yuri story, this was very satisfying. The length was also just perfect. Having any more chapters showing them getting into fights again would have probably killed the charm, so limiting it to only one volume was definitely the right decision. For some reason, I was put off by the the art in Inugami-san to Nekoyama-san, which was also done by the same artist. The art didn’t feel right for a lighthearted story like this, and I’ve always felt as if this kind of art style would fit a darker kind of story way better. Even if LOVE/DEATH is still a comedy, the art suits the story way better this time, and I believe that drawing scary faces like the ones you see below is one big talent of Kuzushiro. This was simply one of the best things about this manga, setting the perfect mood for what was to follow after causing such an expression to surface. I think I don’t need to say anything here, since this is a pure yuri manga. I do believe that Kuzushiro could have done more with a setting like this, but even with this monotone storyline, this manga still felt quite refreshing, making it a welcome read between your typical lovey-dovey romance ones. I actually hope that just like Inugami-san to Nekoyama-san, this one as well might get picked up to be made into a short-anime. Wouldn’t that be great? This entry was posted in Manga, Manga Review, Yuri and tagged Anime Adaptation, Kuzushiro, LOVE/DEATH by Lena K.. Bookmark the permalink. It really would make a great short anime. If something like Makura no Danshi can get made, shouldn't we be able to have this? If only someone would delve into the reasons why certain manga get anime adaptations and others don't…. But yeah, someone should probably talk about why certain manga get an anime adaptation while others don't. That's seriously an interesting topic. Yeah, I'd love a little short of this. But the next part of the manga could be really great too. So maybe they're waiting until the full manga's out? 7 Chapters won't really cover a season, even with it being a short. While I can appreciate any story that goes for something more refreshing and new, the premise for this got extremely boring very quickly for me. It's not bad by any means; at least the chapters were short so the story wasn't drawn out even more. Hopefully there aren't anymore plans to continue this series (at least Mangaupdates says it's complete, but who knows), because there's not much more you can do with the story. I would be in favor of seeing this made into an OVA or something like that as well though. Yandere couple. Like Sabagebu having a jerky protagonist it's nice to try something different every now and then. This was a wonderful read and I look forward to the extra and the other story taking place in the same school. i really liked lovedeath, it was different and that's what made it great. I think there needs to be more diversity in the yuri genre. I mean there's hardly any yuri harems out there. Also have you been reading Netsuzou Trap. I consider myself to be a huge yuri fan, but BUT i really want this to end in het, because the guy is so nice and the girl (hotaru) is such a bit**. However i'm positive it's going to end yuri. it's going to be the first time i'll be disappointing in yuri. . Unfortunately, the manga has already ended. I do believe that the manga has ended, and I also think that the length was just perfect. Any more and it would have started to get boring. I agree, we need way more diversity in our yuri manga. High School stories are starting to become boring to me. However, I would really hate to see Netsuzou Trap ending with het. Normally i would be the same, but i really dislike Hotaru. She is jealous and decides to make her move knowing she's on a relationship. She also plays off all her advances and it's not cheating because they're both girls. She does not care about leading other guys in relationships. She does what she wants and does not care about anyone else, she puts herself first. The guy on the other hand is willing to sacrifice his happiness for pthers and is overall a nice. but yea it's most likely going to end up yuri. On another subject i just decided to buy Kisses, Sighs, and Cherry Blossoms Pink: The Complete Collection. I was deciding between that and girlfriends and decided to go with this. Now i'm deciding if i should get girlfriends or akuma no riddle. Does the manga have more yuri than the anime. 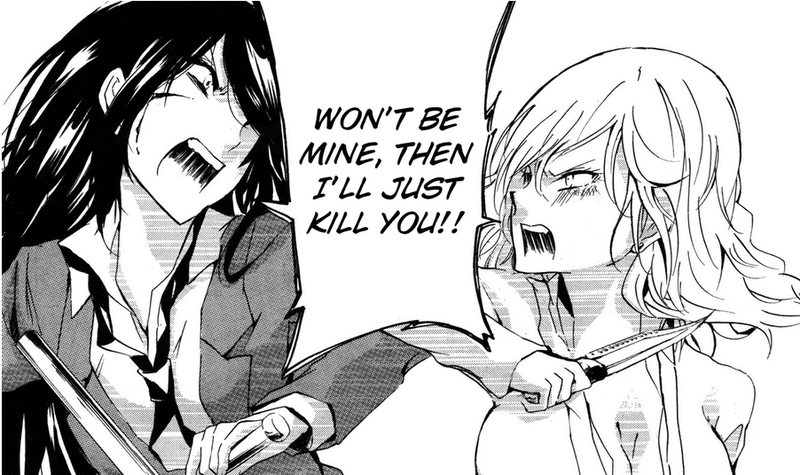 Yandere and I don't get along, but it totally worked for me in this manga. So happy that you reviewed it! Coming to your question, it all depends. 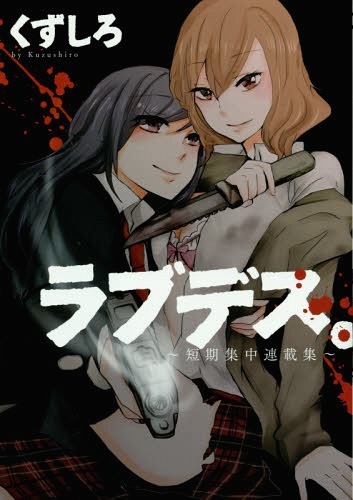 Do you want to read 100% yuri, with a superb love story between two girls or are you more into an action manga with lesbian killers, but with only about 60% yuri? Well, the manga does have more yuri than the anime, but only in some parts. It's mostly the same as what we saw on TV. Hmm i know there are beter posts to talk about this but i just dont have the patience to go there…. I just finished reading a manga from Morinaga Milk, “Himasama no Kagami” in dynasty scans the title is “Secret of the princess”, and i was wondering if you had already posted something about it. If you havent maybe you could do it (please…)…. Its a nice manga. I really liked it. Oh yes, I haven't finished that one yet. It's on the list, but stuff like Love/Death or Netsuzou Trap are getting in the way. Hmm ok. Thanks for your reply. I cant wait for your post about it. I really enjoy reading the stuff you guys write.